Visit the web pages below to get directions and plan a trip. 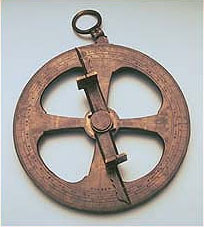 Samuel de Champlain's astrolabe, dated 1603, which was lost in 1613 and recovered in 1876. (Canadian Museum of Civilization). Visit the waysides at Red Beach to learn about the settlement and its occupants. Stand at the shore and compare Champlain's drawings with the island directly in view across the river. Follow an interpretive walking trail along the banks of the Saint Croix River, with waysides and statues depicting the French settlers and members of the Passamaquoddy tribe. The island itself is only accessible by boat, and commercial tours are prohibited from landing. Located in Augusta, Maine, the museum currently houses several artifacts excavated at Saint Croix Island. The collection is on loan from the NPS.